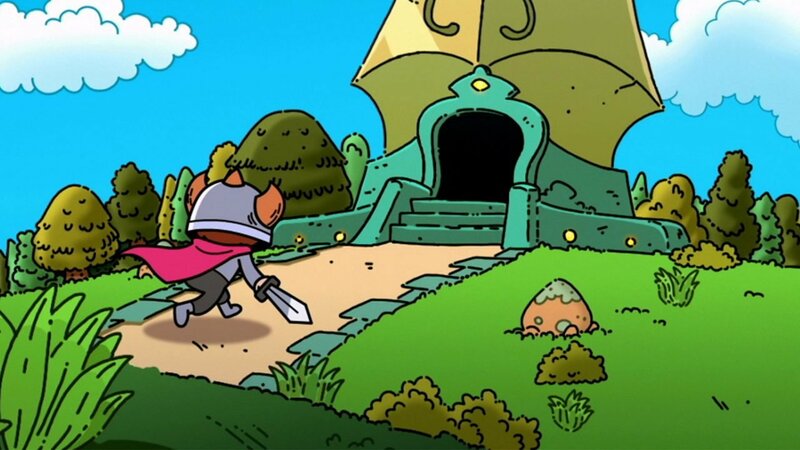 After teasing a new game yesterday, Devolver Digital announced a new game ahead of their press conference at E3 this year — an action RPG developed by Onebitbeyond titled The Swords of Ditto. Slated for an early 2018 release on the PlayStation 4 and PC, The Swords of Ditto will have players teaming up with a friend in a local co-op adventure to rid the land of evil. Players will be able to explore an overworld filled with enemies and the treasures of past heroes in their quest to level up and get loot. The game also has dungeons that players can tackle with puzzles that can be solved either alone or with a friend. The game has players becoming legendary heroes of the Island of Ditto. Whether players succeed in defeating the evil or not is recorded and carried over into later playthroughs. Players can even find monuments to previous characters where they might be able to find loot to take into new adventures. That loot takes the form of traditional weapons such as the sword and bow alongside less traditional ones such as a vinyl record Frisbee and a magic golf club. Players can also collect stickers to equip. These stickers can provide boosts to your hero and add perks to your equipment. The Swords of Ditto is joining the Devolver Digital family of games alongside others such as Enter the Gungeon and Hotline Miami 2. It is the first game from Onebitbeyond, a company founded by Jonathan Biddle the former director of Stealth Inc.